Happened upon a listing for the Pickering Creek Inn building which is apparently up for sale. Asking price is $1.7M. When I waited tables at the Mansion House, I was told a ghost sometimes appears in the basement. I didn't see anything for two months, though. 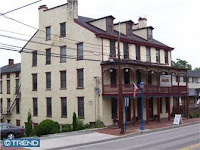 Great building, there are a few other PA inns for sale right now as well. I think that place has such wonderful potential, if only I had the money! New site for the library? Pickering Creek is a one of a kind pub! I will especially miss the Beer Bible!!! Hopefully, someone will buy it and keep it the way it is!